Habitat for Humanity in Wayne County is a non-profit organization that seeks to unite volunteers with those in need of affordable housing. Habitat depends on donations, various fundraising efforts, a joint venture with the future owner and volunteer labor. Habitat works with low income families who are unable to secure a conventional home loan but are willing to invest "sweat equity". Helping people build new houses and rehabilitate existing homes often transcends boundaries of culture, race and status. The result is a decent, simple home for a family in need and a greater sense of community for all those involved. “Habitat for Humanity in Wayne County, Inc. works in partnership with God and people from all walks of life to develop communities with God's people in need by building and renovating houses. Habitat in Wayne County is committed to partnership in which the self-esteem of the partner family is enhanced and each family can become active contributors to their respective communities." 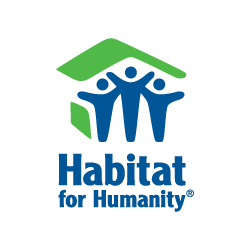 Habitat for Humanity International was founded in 1976 by Millard and Linda Fuller in Americus, Georgia. It is now operating in over 1500 North American cities and more than 75 countries worldwide. While 200,000 homes have been built by Habitat around the world, here locally our affiliate is quickly nearing its 50th home. We are excited by our continued growth, as well as the growing support of our communities who share our mission of eliminating substandard housing. The homes we build are sold to the partner families who qualify for a no-interest mortgage loan of $55,000.00. The monthly mortgage payments are tailored to fit the families' income. And though the homes are simple and decent they are almost always a great improvement from the housing they once occupied. We are always looking for volunteers. It doesn't matter if you are a professional or novice, woman or man, construction or office skilled - we have volunteer opportunities for anyone genuinely interested in helping solve the affordable housing crisis facing so many families. What are your skills (experience is not necessary)? What type of volunteering would you like to do? Include your full mailing address with your message.